The colonial flags (Natal, Cape Colony, Transvaal and Orange River Colony) became dormant when they joined together to form the Union of South Africa on 31 May 1910 and the Union Flag of Great Britain became the official flag. Apparently it was the custom in the former South African colonies to use and regard the colonial flags for use on land as well as at sea. I think this was more a case of ignorance by the locals about the finer points of British vexillology. The Cape colonial Blue Ensign became generally known as the Cape Government flag which implies that it might have been flown at various colonial offices, but I have found no records to confirm this. The same applied in Natal. When the Natal Legislature on their own initiative adopted both a Red and Blue ensign in 1870, the Blue Ensign was later modified on instructions by the Colonial Office as the Natal Seal which they had placed in the fly was too complicated. The Blue Ensign was then apparently designated as the only valid colonial flag for Natal. The inhabitants did, however, continue to use the original Natal Red Ensign. There is a surviving example in the Killie Campbell Library in Durban. Even the Boer republicans acknowledged the Cape Government flag as representing the Cape Colony. The design of the little New Republic's flag was a vierkleur with the blue and green bars interchanged. But the original design approved by the Volksraad made provision for flaglets on each bar: on the vertical blue bar a small Union Jack, on the horizontal red bar a small Zuid-Afrikaansche Republiek (ZAR) vierkleur, on the white bar the Orange Free State vierkleur and on the horizontal green bar the Cape Government flag. As far a I can ascertain, this complicated design was, perhaps fortunately, never made or taken into use although the plain version without the flaglets was used until the New Republic was absorbed by the ZAR. Later it was for a time also used as the municipal flag for the town of Vryheid - formerly the capital of the New Republic. When the warrants were issued for Red and Blue ensigns for the Union of South Africa in 1910-12, the Red Ensign came to be regarded by the citizenry as the national flag, erroneously of course as the national flag of the Union officially remained the Union Jack. Even in Government circles - when Union troops under the command of General Louis Botha (he was also the Union's Prime Minister) took the town of Windhoek in German South West Africa in March 1915, he hoisted the SA Red Ensign over the Tintin Palast (the German Governor's Residence). There are even indications that the South African Blue Ensign was used over overseas offices of the Union Government. Even after the Union adopted the new national flag in 1928, it continued to use the South African Red Ensign in its proper role as the Merchant Marine ensign until 1951 before the Merchant Shipping Act of that year designated the orange-white-blue national flag also as the Merchant ensign. You might be interested to know, that I discovered a picture of South Africa's first flag (1910-1928). It was a red ensign (a red flag with the Union Jack in the upper left corner) and it had a crest on the fly with four quarters, in each of which were the emblems of the former provinces - Cape, Natal, Transvaal and Orange Free State. The governing authority in the British Empire for flags flown at sea was the British Admiralty. On 28 December 1910, Admiralty warrants were issued for two South African ensigns, the Blue and the Red. They were both to be charge on the fly with the quartered shield from the Coat of Arms. Initially the shield was NOT placed on a roundel. The Blue Ensign was, in accordance with general British practice, to be flown by Government vessels (not warships of which South Africa had none anyway at the time), and the Red Ensign by South African merchant vessels. The Blue Ensign version was rarely seen in South Africa as South Africa had few such government owned vessels at that time. There is evidence that it was used on occasion on overseas offices of the country until the new South African flag came into use in 1928. The design South African Red Ensign was amended by Admiralty Warrant on 25 March 1912 so that the shield could be more readily distinguished by placing it in the centre of a white roundel. This did not apply to the Blue Ensign. The Red Ensign was for use at sea as the merchant fleet ensign. This version of the South African Red Ensign continued in use in the merchant navy until 1951 when it was finally displaced at sea by the South African national flag in terms of the Merchant Shipping Act of that year. The Red Ensign was, at times, also used as the national flag ashore, although it was the Union Jack that officially enjoyed this status. These flags never enjoyed much support and were regarded more as necessary conveniences than as symbols of the still non-existent national unity. They were largely ignored by both segments of the white population and rarely flown in public. The Red Ensign's most prominent moment was probably when General Louis Botha, former Commandant-General of the Zuid-Afrikaanse Republiek forces, later Prime Minister of the Union of South Africa and Commander-in-Chief of the Union forces, hoisted it over Windhoek (in the then German South West Africa), after capturing that town from the Germans in 1915. The South African troops fighting in East Africa, the Middle East and in the trenches in France during the First World War, did so under the Union Jack. Source: "Sovereign flags of Southern Africa", A. P. Burgers, 1997 [bur97]. Various sources inform us that the Red Ensign with South African flag badge was replaced by the South African national flag as the merchant ensign in 1951, and some writers state that this was in terms of the Merchant Shipping Act 1951. Well, section 65 of this Act, in its original form, did indeed state that "the national flag of the Union is hereby declared to be the national colours for all ships registered in the Union" -- but the Act wasn't brought into operation in 1951. It was kept in abeyance for several years. The list of authorised flag stations in the revised Instructions for Flying the National Flag issued in 1958 (Government Gazette 6085 dated 25 July 1958) included "ships of SA nationality in accordance with the provisions of section sixty-five of the Merchant Shipping Act 1951 (Act No. 57 of 1951) as soon as it comes into operation". The Act was eventually brought into operation on 01 January 1960. So, on the face of it, then, did the Red Ensign legally remain the merchant ensign of South Africa until midnight on 31 December 1959? Or does anyone know of any proclamation or government notice or official pronouncement to the contrary? The abolition date of the South African red ensign is in fact 1951. Despite the introduction of the South African National flag on 31 May 1928, the red ensign continued in use as the Mercantile Marine flag until 1951 in terms of the provisions of section 65 of the Merchant Shipping Act 1951 (Act No. 57 of 1951). Source: "The Union Jack over Central and Southern Africa 1795 - 1994" by FG Brownell, SAVA Journal 1994 [brl94]. What is the evidence that the Merchant Shipping Act 1951 was not brought into operation until 01 January 1960? The effective date of the Merchant Shipping Act is printed at the top of the Act in the Butterworths printed statutes of South Africa. Also, John Hare's book on Shipping Law and Admiralty Jurisdiction in SA (1999) mentions the date several times. The Act provided that it would come into operation on a date to be fixed by the Governor-General by proclamation, so there is no doubt a proclamation buried in the Government Gazettes which would be an original primary source. The Instructions for Flying the National Flag which were issued in July 1958 required the national flag to be flown on ships registered under the Act "as soon it comes into operation", which implies that the change of flag had not yet taken place at that time. An on-line 2003 copy of the Merchant Shipping Act of 1951 is headed "Assented to 27 June 1951". "Date of commencement 01 January 1960". A possible explanation for this contradictory information can be found in Pama's Lions and Virgins (1965) [pam65] where he states that, "It (the old Red Ensign) only disappeared when, in 1951, all ships registered in South Africa were requested to fly the new flag." This suggests that merchant ships were expected to fly the national flag after 1951, but that it was not legally enforceable until 1960. It would be interesting to know why implementation of the Act was delayed. Clarification of the issue of the starting date for use of the former South African national flag as the ensign of merchant ships will ultimately need to be determined by one of our South African members. However, as David Prothero has pointed out, the Merchant Shipping Act 1951 of South Africa can be read on the internet. The heading states: Date of Commencement: 01 January, 1960 (Unless otherwise indicated). Section 358 states "This Act shall be called the Merchant Shipping Act, 1951, and shall come into operation on a date to be fixed by the State President by proclamation in the Gazette: Provided that the State President may from time to time by proclamation in the Gazette bring into operation only such portions of this Act as he may specify in such proclamation." Therefore it is possible that section 65, which related to the shipping flag may have commenced earlier than the Act as a whole. The notes to the Act do not indicate if any parts did (or did not) come into effect prior to 1960. The on-line version of the Act only shows the current text of the Act, which has been extensively modified by various amendment acts. Sections 19 to 67 were repealed by Act 58 of 1998, and I have not been able to locate the original text using internet resources. Maritime law was one of the last areas of the law to migrate to local legislation in Australia. The Imperial "Merchant Shipping Act 1894" continued in force in Australia until the Shipping Registration Act 1981. Continued access to the established British Admiralty law, its precedents and courts relating to the international enforcement of ship-mortgages, ship registration, marine safety and insurance procedures, and the continuation of laws relating to seamen and ships officers and the carriage of goods by sea would have been seen as a pragmatic advantage that resulted in parts of the UK legislation continuing in force in Australia long after the Statute of Westminster of 1931. A similar situation probably occurred in South Africa where the intent was likely to have been to progressively migrate the maritime law to local legislation, but the coming to power of National Party Prime Minister Verwoerd, who advocated South Africa becoming a republic outside of the Commonwealth (which occurred on 31 May 1961), possibly led to the 1960 commencement of all of the South African Merchant Shipping Act. I also note the observations of the late Andries Burgers in The South African Flag Book [bur05], on page 152 where he states: "The Union Nationality and Flags Act of 1928 had not made provision for the new national flag to be flown at sea by South African merchant vessels. The 1912 version of the South African Red Ensign would therefore have continued in use in the South African merchant marine until 1951 when it was finally displaced at sea by the South African national flag in terms of the Merchant Shipping Act of that year. 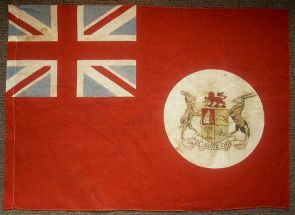 It is not known for certain whether the South African merchant marine actually used the defaced red ensign, but if they did, there are indications that after 1928 South African merchant vessels reverted to the British undefaced Red Ensign and it is considered that the reason might have been that the defaced red ensign was no longer manufactured and thus became unavailable when the new national flag was taken into use ashore." Since my last post, I've located the proclamation which brought the Act into effect. It was signed by the Officer Administering the Government (the Governor-General having recently died) on 08 December 1959, and published in the Government Gazette 6337 dated 24 December 1960. It brought the Act (except for sections 68 to 72 inclusive) into operation on 01 January 1960. I looked in the Government Gazette indexes for 1951 and 1952, but found no proclamation to bring section 65, dealing with the flag, into operation at that time. As David Prothero has pointed out, various reference books in the 1950s gave 1951 as the date. However, none of them is a South African publication. The earliest SA publication which I've found which refers to the merchant flag is Pama's Simbole van die Unie, published in 1960, which reproduces, in full, the instructions for flying the national flag had been published in Government Gazette 6085 dated 25 July 1958. Those instructions required the national flag to be flown on merchant ships registered under the Merchant Shipping Act 1951 "as soon as it comes into operation". Is it significant that none of the sources which give 1951 as the date are specific as to day and month? Had there been some kind of directive to change the flag in 1951, there would surely have been a specific implementation date. And wouldn't the world's maritime authorities have had to be informed that as from such-and-such a date, SA merchant ships will wear the national flag instead of the Red Ensign? None of the sources I mention earlier give a precise date because a precise date was apparently not specified. In the 1953 edition of Flags of the World Gresham-Carr [car53] wrote, "The South African Shipping Act, No. 57 of 1951, section 65, states: 'The National Flag of the Union is hereby declared to be the national colours for all ships registered in the Union.' "
I think it is correct to say that as far as foreign countries are concerned a maritime flag has the function that its government says that it has. A flag's legal status within its home country is no business of foreign countries. The South African government announced in 1951 that the national flag was the merchant flag, and although this function of the national flag became legally unenforceable for a time, the government is not recorded as having changed or retracted the 1951 announcement. It seems that the national flag replaced the red ensign in 1951 and continued to be used as the merchant flag until 1994. Due to a legal problem, that was probably not directly connected to the flag, use of the national flag as the merchant flag could be only requested, and not enforced, for a few years immediately before 1960. Please can you help me in identifying and dating this flag. It is South African from 1910. This is an unauthorised version of the South African red ensign, which bears the full Arms in the fly instead of just the shield. How this version came into being is not known as the Admiralty Warrant authorising distinctive ensigns for South Africa, dated 28 December 1910, clearly specified that only the shield from the Arms should appear in the fly. It would appear that this version dates from 1915 in view of its similarity to the Colour presented to General Louis Botha in that year during the South West Africa campaign. At the outbreak of World War I, at the request of the British Government, General Louis Botha led a South African expeditionary force into German South West Africa which entered Windhoek in May 1915. General Botha received the surrender of the main German force of 3 400 at Tsumeb in the north of the territory on 09 July 1915 on behalf of King George V. A silk Colour in the form of a South African red ensign with the full Arms in the fly was presented to General Botha by the ladies of Worcester in the Western Cape. This was hoisted in Windhoek on 31 May 1915 by General Botha's second son, JCS Botha. The similarity to the flag shown above would seem to indicate a common origin and a number of such unauthorised versions are known to exist. This black and white newsreel (from 0:45 onwards) shows two ensigns of this pattern draped in front of the pavilion at the Union Buildings in Pretoria. The shade of the field of the flag matches the field of the Union Jack canton - which we know to be blue - rather than the cross or saltire (which we know to be red). Although the date of the newsreel is given as 1927, the events shown took place in December 1926. The fact that the ensign in the newsreel was displayed at the government's head office building, on the occasion of a speech by the Prime Minister, suggests that it was officially sanctioned. It was not approved by the UK Admiralty, but if its use was confined to land, it didn't need to be. Perhaps it was authorised by a cabinet decision, in which case a search in the National Archives in Pretoria might prove fruitful. Evidently the coats of arms on the backs of the flags were in reverse. The governing authority in the British Empire for flags flown at sea was the British Admiralty. On 28 December 1910, Admiralty Warrants were issued for two South African ensigns, the Blue and the Red. They were both to be charged in the fly with the quartered shield from the Coat of Arms. Although the design of the Red Ensign was amended in 1912 so that the shield was to be placed on a white roundel, this did not apply to the Blue Ensign. The Blue Ensign version was rarely seen in South Africa as South Africa had few such government owned vessels at that time. There is evidence that it was used on occasion at overseas offices of the country until the new South African flag came into use in 1928. Various sources state that the ensign was replaced by the National Flag at the end of May 1928. Certainly, the flag-flying regulations issued in May 1931 stated that the National Flag was to be flown on "government craft when within Union territorial waters". However, on the high seas, the defaced Blue Ensign evidently continued to be flown until the late 1930s, if not later. The South African Railways & Harbours operated a few steamers, which regularly sailed to the Far East and Australia. According to a July 1937 article in the Adelaide (South Australia) newspaper, The Advertiser, when these ships were in South African waters they flew the National Flag, and when they were on the high seas they flew the defaced Blue Ensign. This was because the Blue Ensign was "recognised the world over", while the National Flag was "not widely known outside the Union".